Let’s choose to make Luzerne County Green one home at a time. We will be bringing you tips, projects and things you can do easily and inexpensively to “green” up your home and neighborhood. With spring finally making an appearance, you may be itching to to get your hands dirty and start planting. But, first you need to clean up the winter debris…..and what to do with all those leaves, and plant material once it is raked in a pile???? Oh my, stuff them in plastic bags and toss them in the dump? Aside from filling up landfills, trashing all that debris is a waste. Try composting! Not only will it solve the problem of what to do with the debris, it will provide good plant food for next year’s adventures in gardening. AND you will save money by not having to buy compost. Compost is organic matter that has been decomposed and recycled as a fertilizer and soil amendment. Compost is a key ingredient in organic farming. At the simplest level, the process of composting simply requires making a heap of wetted organic matter (leaves, “green” food waste) and waiting for the materials to break down into humus after a period of weeks or months. Compost can be rich in nutrients. It is used in gardens, landscaping, horticulture, and agriculture. The compost itself is beneficial for the land in many ways, including as a soil conditioner, a fertilizer, addition of vital humus or humic acids, and as a natural pesticide for soil. First you will need a space to put the material while waiting for it to turn into compost. The ideal location for your compost pile is under a tree. The partial shade will keep the pile from drying out too fast. However, it should not be a tree that is highly acidic such as pine, black walnut, juniper, eucalyptus or cypress if you choose to use an open container style of composting. The compost heap should be located near a garden hose or other water source so that you can easily control the moisture level. A location near the kitchen is helpful, but more important is a location that has good drainage. It’s also useful to have an area near the pile to store materials that will be added to the pile later. Next decide if you will use a container or open style. A container style is usually a barrel like container, closed at both ends. The open style is more like a heap, open to the elements, and may have some sort of containment around the sides. There is debate among compost enthusiasts as to which is the best style. A container style keeps the material confined to one nice and neat area, and the container itself helps keep the heat and moisture in the material and thus speeds up the decomposition. Containers can be placed anywhere you have room. The downside is you need to find a container large enough to hold the material while it is doing its thing, and depending on how much material you have, you may need two or more containers. The open style is the least expensive, and is the easiest for adding more material, and removing the compost later. The downside is it can be unsightly, and depending on the weather you may need to water it to avoid the material from drying out. How to Compost | By DoItYourself Staff gives some good information on the two styles of containments and suggestion on how to build your own. Now we start cooking. Everyone who composts has different “recipes”, and it varies depending on the materials at hand, but in the end it all turns to compost, and that’s what we want. If all your material is “Brown“, meaning dry leaves, dry grass, wood shavings/chips, you will need to water it down after placing it in your container. “Green” material like wet grass clipping, wet leaves, food scraps do not need more water. Brown material tends to keep the compost cool, but it adds carbon to the mix and this is good. Green material heats up faster, and will decompose faster, plus it adds nitrogen and this is also good. So ideally you want a mix of green and brown materials where the mixture would be 50 percent greens and 50 percent brown, but this can vary from 1/4 to 1/2 green and 1/2 to 3/4 brown. Layer the green and brown to get things started. If you decided on the open container style, you’re in luck. The open style gives you easy access to turn the composting material. Every 3-4 weeks, turn the compost using a pitchfork, shovel or compost aeration tool. Turning the compost will speed up the decomposition process and makes the difference in having usable compost in 2-4 months as opposed to 5-12 months. Turn the inner most material to the outside of your containment area, and the outer most material to the inside. This helps regulate the temperature evenly throughout. If the material seems too dry, water it thoroughly, or check your local weather forecast and hope for rain. If you went with a closed container style, well, think of it as exercise. Making sure the cover is secure, put the container on it’s side and roll it a few times to mix. Return it to its upright position. You will also want to check to make sure it is moist enough. Add water as needed. TIP: Have two containers. One for your composting material, and one empty one. Using a pitchfork or shovel, move the composting material to the empty container. This mixes the material, both old and any new material you may have added. No need to shift the material back to the first container, you can do that the next time it needs mixing. WHAT CAN I TOSS IN TO COMPOST? You can toss in just about any yard debris. See: How to Compost | By DoItYourself Staff for specific handling of some yard debris, food waste, manure and other materials. Toss in grass clippings, cut/bruised woody material, leaves, and all of the clipping from your shrubs and bushes. Did you know you can compost paper towels, toilet paper tube and shredded newspapers? Shred or cut them up into small pieces and toss them into the compost. The paper material also helps to retain moisture balance, so you may not need to water as much. Miscellaneous materials like feathers, sawdust, straw, wool, cotton, silk, evergreen needles, and lint are all great compost additives. Remember- the smaller you cut it up, the faster you have compost! Don’t toss your coffee grounds in the garbage – compost them! Used coffee grounds are rich in nitrogen. For you soil geeks, here’s why: Nitrogen allows plants to convert sunlight into energy; phosphorus helps that energy get transmitted throughout the plant through its root system and cells; potassium helps the plant retain moisture, which aids photosynthesis.) When managing the “ingredients” in a compost pile, it’s important to have proper balance: Nitrogen-rich material (greens) needs to be appropriately tempered by carbon-rich material (browns). TIP: Used coffee grounds also repel ants. Sprinkle the used grounds around your garden and foundation of your home to keep the ants away. Imagine how much easier it will be to take out the trash when the bag is lighter, and how much you will save by not buying compost. What are you waiting for? 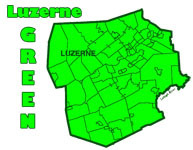 Let’s get composting and make Luzerne Green!